Our goal is to improve your quality of life through promoting the knowledge, appreciation, and enjoyment of beer. We aim to share our enthusiasm for beer, and make it accessible and compelling to anyone interesting in beer or beer culture. This what your Hear Hear for Beer Blog Ad will look like to visitors! Of course you will want to use keywords and ad targeting to get the most out of your ad campaign! So purchase an ad space today before there all gone! I have kids. We love amusement parks. And sometimes, there’s alcohol at them. After visiting an Universal Hollywood with the kiddos again a couple weekends ago, being teased about the beer selection at most of those this past weekend when out with my cousin and Disneyland mentioning they’re redoing Ariel’s Grotto (I’ve eaten there. I have a daughter.) into a bar, here’s my loose, informal rankings on best of the parks to drink in. *Note: I’m not including six flags or train towns or those others that may serve beer but I haven’t enjoyed any there and there’s so many versions of these across the country I don’t want to judge all based on one. And, I don’t believe Hollywood Studios had Baseline bar when I was there, nor any alcohol, so I drank nothing before riding on the one that had the Alien thing or Indiana Jones stunt show. This was about 6 years ago and I barely remember it, but it was just stumbling into a stand that sold beer. And it was a prop counter over a kegerator. Honestly, I’m pretty sure it was Karl Strauss (this was before Untappd for me), but it was not very memorable and I just randomly found it and was unclear about whether I could bring it into the show so I downed it quick, which those that know me know that means slow, and went in. And it was the only kiosk I noticed the rest of the day. And I’m including it because unlike Six Flags, I’m likely not ever going to another. Again, I know there’s going to be a bar welcoming people to Pixar Pier, but last year and the Taste of California booths, or I believe it was only one booth, had beer. And it was craft (I tried to find it on untappd but didn’t). However, before that it was the same deal, a slightly bigger stand than Seaworld that sold Karl Strauss beers. But I know this will be the one jumping up the list soon. They’ve got macros and Florida Beer Company brews masquerading as Harry Potter Beers or Duff. But it’s fun to pretend. Imagination helps here. Still, they’ve got tons and tons of the popular convenience store brands. And it’s fun to have beers then run up that mountain of stairs from the bottom level to the main level. And if you’re walking through city walk, you’ll pass KARL STRAUSS. They also have all those macros and Florida Beer company, but they also had at least 1 craft brew there (CB Craft was the one I had there). And they might have had more in the monsters café or other spots. But they also have Cigar City right outside in their city walk. That’s a plus. There isn’t much here to choose from in terms of locations, with the Knight’s Table restaurant being the one with the best selection aside from the hotel bar and restaurant that is right outside the park. But they sure embrace their San Diego-ness (Carlsbad, I know) with Stone and some other locals. There was even a 21st Amendment there. None of the rides is very intense, so this is a good location for drinking because kids can do it all pretty much on their own while you drink and relax. They also embrace their San Diego-ness…with KARL STRAUSS!!! Well, and some others, but they have beer everywhere. Since it’s a place without rides except the overhead gondola thingy, it’s a perfect place for drinking. And they know it. Stone, Ballast, Mission, they’ve got a good selection and it’s not limited to eateries. They’ve got kiosks everywhere. And sometimes, it helps to have a beer when you’re walking around everywhere trying to not be sad about the animals. I think we all knew this one. Drink around the world without leaving the park people. Just don’t do it before Mission Space. Have an idea to write about something related to beer. To do so, enjoy a beer while writing. Eventually, after a beer or thoughts of a second, interest begins to wane in a continuance of writing. The written piece then is either paused until beer is finished and another day beings the ambition to complete the piece or I run to the finish with an influence of alcohol in my words. See the last blog entry as a prime example. Something I began to write immediately at the end of that day of the Germany-France friendly. And it too three tries and some beers before I just decided to finish it off. The end of that post can be read in the voice of a drunk old man in a bar ranting about soccer and remembering every now and then to drink more of that warm beer in his hand. So I decided to write this one while at work and quickly finish it. As I’ve been known to enjoy a tasty beer while at work sometimes. I was out with coworkers this week for lunch. And a beer, because a beer at lunch often makes me happier to return to work after. The Germany-France friendly was on. It was already 0-1 France when we were seated before halftime and as much as I tried to stay involved in the conversations I still kept looking up every time some fast motion would catch my eye. Finally, in the 56′, Mesut Özil drove a pass forward to Timo Werner, who, despite what looked like a stumbling step to gather himself, was able to smoothly jab the ball between the lunging keepers legs for a goal. I looked up in time to see Ozil send the pass, but when the goal was scored my fist punched the air just like Werner’s in celebration. My other coworker, who had actually been to the World Cup in South Africa and has talked at length with me about it, chuckled a bit. Lately, the soccer world around me has had enough ups and down that a good beer is exactly what I need to enjoy it all and ride it out. Aside from kid stuff, I can say that much of the fun started with finding out too late that San Francisco had a professional team over the summer of this year up through watching a USWNT match in person last weekend. And sure, that Germany-England match Tuesday, but the biggest excitement there may have been the fashion show of the new 2018 World Cup kits with the funky font since it was a friendly and more so just getting another run in before winter hibernation. I know exactly when I really became a huge fan of soccer. World Cup 1998 when I was working at a wholesale bakery. Before that time, soccer was just something I knew existed from playing briefly as a kid and a good friend in high school who was the only female on the team as well as an all-girl club team. My cousin would remind me of it when the World Cup was hosted here and how good Ronaldo was (the original one). But I lived basketball all through high school and college. No other sport existed. And when I was finally done playing basketball and out of college, I had time for another sport to settle in. At this bakery, I had started a couple months before the cup, but worked in the office and didn’t know many people beyond the office and some drivers. So when the cup came, and the radios in every corner of the building was playing it in Spanish and English, I really got to see everyone’s personalities. Only two people in the office cared, and the one who understood the sport supported the US while the other backed Italy only because he was Italian and not because he followed the sport. The 2nd-in-command baker was English — enough said there. Many of the other bakers were Mexican or from other Latin or South American countries. The night manager was Jamaican, who made it that year. The driving team had people from Mexico, Norway and Germany. And even the head of packing and sorting was from Saudi Arabia, who was as stoic as could be but would still follow the matches. Everyone would cheer or jeer when goals were scored. I had no idea what was happening, but everyone was having so much fun. One driver, Ralf, had the great story of how much he loved watching Germany beat Mexico at home with his Mexican girlfriend. He knew I was part German and asked why I didn’t watch and support. So I had a beer and settled in on the 4th of July to watch Germany…get crushed by Croatia. And no, I never thought about supporting the US team. They were long gone by the time I started to follow. However, the US was back in it for 2002 in Japan and Korea. And they made it to the quarters…where they lost to Germany. Maybe it’s because I am my mom’s child, and she very much was someone that liked to take the opposing side in sports matches just to talk trash, but I was all in for Germany, even as they lost in the finals to Brazil. In 2006, I was working for a job where I traveled to conferences, and was on Las Vegas for a week of the cup. It was pretty awesome waking up early to head to a trade show floor and seeing Iranian backers with flags and even a painted face sitting the sports book watching the match. It was for an Israeli company and it was fun for all of us teaching the one person in our marketing department that didn’t understand any of it all about it. And Germany hosted and went far with a team I didn’t realize until much later was a terribly flawed team and Die Mannschaft und alles deutsche Fußball was undergoing a reboot. As I really started to dig in right after that cup (and more time at home with kids) is when it became part of me. I don’t really follow the leagues, only slightly following Bundesliga. I don’t support any club teams, I really just follow the cups so I don’t end up spending too much of my time and liver on soccer. Since there are so many national tournaments, I still get to keep this as my part time sport after basketball. And yes, I have even learned to follow and tolerate the USMNT, even if my emotions are not really invested in them. One thing I love about soccer more than any other sport is the spectator rituals and patterns. Regular matches usually last no more than 2 hours. Halves are fairly reliable for their 45 minutes and a little extra for pee breaks and other predictable intermission activities. Pregaming really is pregaming, often with communal and other recreational activities taking place right at the entrance. Traffic patterns follow these time blocks. And there are very few pauses in the action for extraneous chatter or tasks to distract someone from watching the match and drinking a beer. I’ve seen a San Jose Earthquakes game at Stanford Stadium, where there is no alcohol sold in the stadium. In many ways it was very surreal at before the game started as I felt like many of the people who were wandering around with me as I looked for better snacks for my kids were probably people looking for beer. At Avaya Stadium, the usual home of the Earthquakes, most people have it down, except for how they should line up, as lines just seem to jut out in odd directions. Everyone gets their drinks and snacks before the match and rush to drain and refill at half. If only they could fix their parking situation. It was actually great to see the USWNT there because I feel like it brought even more knowledgable fans to the stadium. And here’s where my issue is with the team that I fully support, both as my local team and because it’s been an incredibly awesome year that I hope has a trick up its sleeve with more years to come, the San Francisco Deltas. I really am hoping that US Soccer eventually works out their issues and realizes that what the US needs most of all is more professional soccer that’s accessible to all areas and not soccer teams and leagues that fit into certain profiles of marketability — especially since we don’t really have a pyramid with promotion and relegation. I am completely confident in my love for the team, and torn about my dislike of the majority of “fans” in the stands. For those that haven’t been following, the NASL was denied Division II status by US Soccer, fought the decision and lost. For now, all is up in the air and the Deltas were able to put aside all the financial difficulties of operating in San Francisco with a team in a sport most people in the US don’t care about and won the league championship. It was a tough go getting people to support a team and sport in the city. And by the end of the fall season, they cut prices dramatically and with the CEO’s good will and generosity of gifting fans with merchandise and discounted refreshments. Yelp and other local “tech” businesses minimally invested but with true sponsorship and no real TV revenue, it was a tough go. But for medium soccer snobs like me, the sheer number of people in the stands who were indifferent to a soccer match happening in front of them (or really next to them, as most were there to socialize and let their kids roam free supervised by security staff and other more concerned and parental spectators). This was readily apparent by their pattern of activity from arrival until end of match. Cheering commenced only when a large enough of people cheered and they were not holding a beverage. They often arrived at least 10 minutes in and after unpacking their items would send their kids to find the flag to run around with while they went to stand in line for refreshments. They then shared their smuggled booze with each other childless couple or other friends with kids joined their group of 24 while ignoring a match was happening in favor of discussing their previous weekend activities and plans for the next day. All while wearing a lot of team branded winter wear. The only thing I could say I had in common with them is that most of them would at least buy a beer to supplement their thermos of mulled wine or flask bottle to add to their hot coffees purchased from Philz or Blue Bottle. I was lucky that the Deltas put on very entertaining and hard fought matches that I was able to tune most of that out except for the beginnings of their arrivals or when I would have to yell at oblivious people to sit down when their greetings were completely indifferent to the sport being played behind them and people there to watch the match. Even weekday evening games were not immune as San Francisco parenting means kids have loosely defined guidelines to typical society norms. In many ways, the Deltas and San Francisco are a perfect pair for a team and general group of citizens with the mindset of not following the norms and working hard to try to go against the mainstream. At least I got to enjoy a beer and watch it all play out. And I would purchase that beer before a match or at the half. Or at the quad in front of the entrance before a match. Or through the wait staff or bartender while watching it on TV. Beer and soccer are a good match. And yes, I did return to my desk at work and checked to see if Germany came back to tie or win. 90+5′ goal. Whew. And yes, I know it was just a friendly, but that late goal deserves a beer. I guess it was just a standing 8. So to update the previous post, Speakeasy has scaled back a bunch but will continue brewing. Maybe they’re stretching to try to get some acquisition or some other mothership to lead distribution, etc. I do hope this means that they will focus on the beer itself. There’s a lot they can do to make a mark with the character of their beer itself. So I hope they focus on living up something more than their website says and aim for “great beer” with less distractions. Last week, Speakeasy Ales & Lagers ceased operations. It was a surprise to the Bay Area beer drinking community. Overall, it really shouldn’t have been. The craft beer business should not be considered “small” or “niche” anymore. Billion dollar acquisitions will do that. Speakeasy has a long, solid history of beer making starting in 1997. They have brewed a good, diverse lineup of beers under a creative theme. Moved to a bigger location and opened a taproom in 2011. A new brewhouse and ramped up production in 2015. And now, a possible permanent pause. This may seem counter intuitive to the rise in the craft beer market, but despite those big buy outs the business slowed in 2016. Combine that with the attention craft brewers are getting and the sheet number of “new” or “hot” brewers that arrived during that recent bubble and some of the older craft brewers that previously had solid financial backing may see those investor looking elsewhere. Speakeasy in San Francisco isn’t the only one. URBM St. and Twisted Manzanita in the San Diego Area closed recently – a region that is a beer mecca and about as friendly a competitive market could be. The Northwest lost 6 well known ones. Even back east, nostalgic “firsts” like Triangle have to close. It can all be blamed somewhat on more competition, but it isn’t all at the consumer level. In my many years working in tech, it is much easier to see there. There are very few competitors within specific categories, but the differentiators have to be distinct between them. And that’s not for the customer to notice, but for the investors. A prospect in tech may go completely against logic and buy something. They may care less about the technology and more about the people behind it. It may just be a “rack fill” buy. But the firms backing these tech companies and their solutions are the truly discriminate consumers. They will look at the whole package and want to see what stands out and what can be molded to stand above. Here’s where I feel most breweries that have been around for 8 plus years will feel the pinch. There are more new kids on the block for investors to take their money to. If your plan 5 years ago didn’t happen completely to their liking, the investors can just bet on the next brewer that was at the same place your outfit was when it was rolling out that 5 year plan. 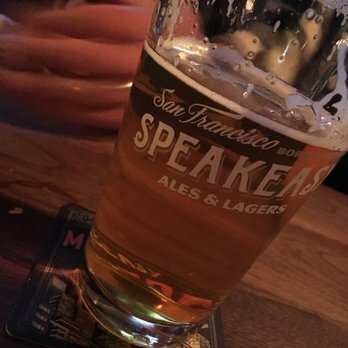 Speakeasy was found around San Francisco, in pizza parlors and even at the ballpark, where it seemed to get just as many craft beer buys as Racer 5 when I was in the buying lines. Outside of SF, they were harder to find. Their taproom was also quite an investment financially and for a 3rd street corridor area that wasn’t quite growing so much in their spot, especially when they’re far enough off the main Muni line that driving still made the most sense for people and driving and taprooms aren’t always the best choice. And they were still chugging along with a new release coming soon after their shut down. So it must have still been a bit of a surprise. Speakeasy put out solid beers. But maybe they’ll be better known as being a perfect example of the craft beer boom and what happens to those that were ahead of the curve and didn’t make it. The beer business story heading into the Super Bowl this year is all about Budweiser. As you likely already know, it’s not about the beer, but the statement made by one of their commercials. Of course, there are very likely to be other commercials in their portfolio with crass humor, talking animals or celebrities. The marketing department at Anheuser-Busch gets the most our of their budget allocation from the mothership. And the commercial itself is a huge uppercut from an underdog challenger, which is an unusual position for the giant known as Budweiser. But the champ here is the one in the White House and all his fans, who were previously the underdog as well. Wait, maybe I should have used a football analogy, like last place team with a 2nd string quarterback against a top ranked defense that completes a deep post pattern to an undrafted wide out on the first set of downs in a game. Hope that was Super Bowl-ish enough. With AB getting bought by InBev, there is an association of America’s Beer now being run by Belgians. But AB is very independent of InBev, with operations really being autonomous and more supply chain, brand proliferation and volume based cost incentives really being the overall impact. Bud really should still be identified as America’s beer in the same way Fiat Chrysler should still be considered part of the American Big Three and not an Italian run Dutch conglomerate. But craft beer really is taking up shelf and tap space, digging into the pockets of America’s beer. That’s one of the reasons they’ve been buying up some craft breweries. And with the trend of craft beer often being identified as “local”, and with the US being as divided about their home territories as much as it is today, America just isn’t local enough. Even naming your beer “America” isn’t going to work. This brings us to a great entry into the category in their commercial portfolio of the nostalgic and heart string tugging offerings, which usually involved a man’s relationship with a horse. This time, they tried to bring the point home of this supposed foreign beer company taking over America’s beer with a fictitious representation of how Adolphus Busch arrived from Germany and met Eberhard Anheuser. This could be called out as alternative facts or just plain based on true events, but it is a valiant ploy to just say that people will persevere against all odds when they have the initiative to make good beer. How AB InBev will continue to come from the outside to America to keep making good beer in the country it started in. It is said this commercial was made and approved well before Trump won. And it’s story is just as much about defying what would be foreign interest beer by making and accepting something as your own. People only latched on to the one line spoken by a character in a commercial passing by the main protagonist. And everything is now politicized. Stances must be taken. People’s own opinions must be applied. So it’s time to boycott America’s beer because of outsiders pushing their agenda on tried and true Americans. It’s beer people. Enjoy it. If there will be a Corona beer commercial shown during the Super Bowl will there be the same backlash with the current white house stance against Mexico? Wait, Corona is Modelo and Constellation that’s run by AB InBev. Maybe people will just drink Coors. Right, their part of SABMiller that is now part of AB InBev. I guess it’s craft beer time for everyone with the inevitable boycot on all AB InBev beers. If only someone did the research to support their political stances. 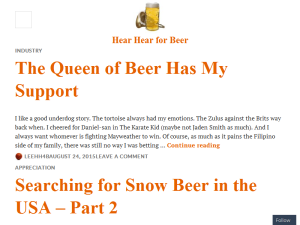 If you are the owner of Hear Hear for Beer, or someone who enjoys this blog why not upgrade it to a Featured Listing or Permanent Listing? We are listed with SEJ as a top resource for bloggers and SEO experts alike!